Do you like to pack when you go away? Do you make lists when you do so? Has your style of packing changed since you had kids (if you have any? See the theme going here? Seriously, I sit here getting this ready for Friday (it is Thursday now) and have a list of things to do. This weekend we are traveling to my niece’s 1st birthday party. There is a lot to do. The laundry is almost finished, I am making a list of items to pack for everyone, and this evening when the boys are in bed I will get the clothing into a suitcase. Packing used to be so easy for me. I could just do it on the fly when it was only adults I had to worry about. Now things are more complicated. How many days of clothing do we need? How many spares for the boys should I take? Do I have enough to keep them busy on the road? This is why I make a list and check the items off as we load them into the car/bags. It just may be the teacher in me making lists, but it helps me organize what needs to be done and ready to go. In honor of the trip a little song that we love to sing when driving. 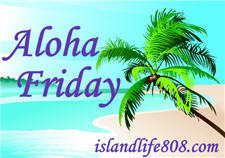 Haven’t seen Aloha Friday, I think I’ll go hope over and participate! Have a great time this weekend! Remember, sometimes it’s the easiest thing that makes them happy – like a toilet paper roll! Yes, I love packing, for vacation that is, lol. Can’t stand packing to move. And yes, I have to have a list, or I know I’ll forget something for sure. I have to pack a lot more, now that I have kids. I need to make sure there are toys & activities for them to do, during the traveling phase, as well as stuff to play with/do when we get to where we are going. Yes, yes, yes! I’m a huge fan (not literally) of making lists. If I know we’re going on a trip, whether it’s a day trip or vacation, I start making my list right away. Next month I’ll be going to Hawaii for a week (by myself); I started making my list of things to pack as soon as my reservations were made (a couple months ago). I’m happy I don’t have kids to pack for this time around. That would be a whole different ball game. I’m guilty of packing too much. I don’t like wearing the same clothes in photos. Plus I usually have a spare clothing or two. I don’t make a list but look at packing lists on the internet. I enjoy packing. Most of the time I do make a list. Sometimes I simply lay out all of the outfits, make sure I have enough and go from there. And YES! Packing did change when our last two came along. It takes much longer when they are little and I generally mix their things in with ours to some extent. LISTS and more LISTS and of course they are different for each member of the family and where we are going – you know stuff like medications, swimsuits, parkas, etc… I do enjoy it and usually start 2 weeks prior so the “favorite shirt or jeans” can be clean and already in the suitcase and they know NOT to pull anything out of a suitcase after I’ve put it in! I check things off the lists as they go in so I don’t forget anything one way or the other. Since I used to work for the airlines and we would always carry everything on (since if our luggage got stolen or lost we wouldn’t be compensated), I loved the challenge of packing. I do have lists, and yes, things have changed since I had a baby…so much more to pack!!! Definetly a list. With 4 kids, the list just goes on and on, and I would be afriad to forget something important, they needed. i hate to pack, I hate to make list and I hate to plan, now having said that. I’m heading out of town soon, and I bought new weekender bags and cosmetic bags and so this time I’m sort of looking forward to packing, and I’ll be packing light so I’ll have to plan my outfits and what I take. Fun times! I hate packing because I always forget something. But I do make a list for myself and all the kids. That definitely helps. I’ve always had packing lists so that I wouldn’t forget anything. Since having kids, it’s more like a packing novel! LOL! I stress over packing! I make lists for everyone, and than I still pack way too much stuff. Would rather over pack than under. And don’t even get me started on UNpacking! LOL! I hate packing AND unpacking! LOL! I always pack way too much. I’m sorry I haven’t been in here too often this week. It’s been super busy. But…I shope you guys have a great trip! Take lots of pictures! And speaking of pics…the carousel pics are beautiful! You did a great job on those! I am a total list person. Even when it was just the two of us everything was written down and crossed off. Now that I have 2 kids we haven’t had the opportunity to vacation yet but I still believe lists are the way. I always make it a point to come up with a check list of things to bring. I always end up bringing excess things. no, i don’t like packing. i don’t think my style has changed as my kids have grown up. it’s just gotten a lot easier from the point where they started packing for themselves.